But that gift can’t be that obvious. It’s always interesting to me how some organizations delight their customers. Or how they assume their customers will be delighted. 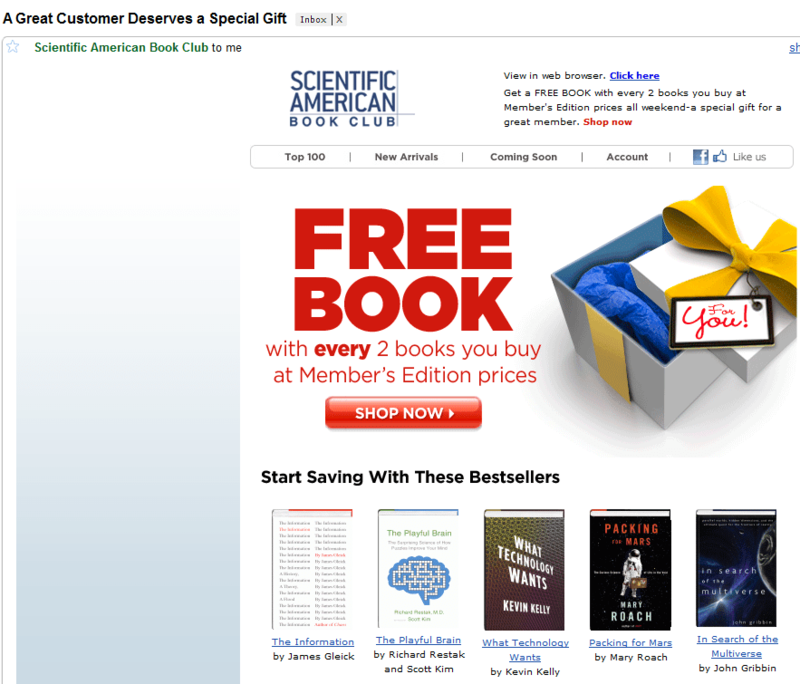 The image above is a promotional email from Scientific American Book Club, it was delivered to my inbox with the title: A great customer deserves a special gift. The title got my attention, but the offer didn’t! Why? Because their offer makes me feel like it’s a hard sell. It’s repetitive and predictable. It actually annoyed me. I mean, are book clubs still relevant? I’m sure in some cases they still are but I’ve never actually felt like I’m in the SCIAM Book Club. Also I can get those books at Amazon delivered to my Kindle for less. The other problem is I’ve been a SCIAM Book Club member for two years and have so far bought two books from them and it wasn’t even by choice. I was forced to. Meanwhile, as an Amazon Prime member I don’t pay taxes and get free two day shipping on most orders. And on top of that, Amazon just threw in free online video streaming rights to about 5,000 TV and movie titles. All that for $79/month. Am I delighted? You bet! The best way to delight a customer is to exceed and/or break their expectations. A type of gift that breaks/exceeds expectations is the one that isn’t directly related the offering a customer expects. What do I mean? For example, us Amazon Prime members didn’t expect to get free online video streaming with our subscription when we signed up. It would’ve been more common to expect a lower price or quicker delivery (incremental value) on our purchases. While that may make us happy it certainly would not have exceeded our expectations. Think about it this way, when you are dating a girl or guy everything starts out really fast and you just want to do everything for your partner to keep them interested. You want to keep them entranced. But as that relationship grows and reality settles in, most of the time, that ‘want’ disappears. Your partner knows your tendencies and knows what to expect. You become predictable. A bore. The way to break this pattern is to do something unexpected, to surprise. And so it is the same with the relationship between a customer and an organization. But in this case, the customer is the receiver and the organizations has to constantly be surprising and delighting. Otherwise you risk becoming a bore, predictable, more of the same. In a world of sameness, promoting sameness is not a viable strategy. Get that out of your head and break the pattern. Tagged amazon, Amazon Kindle, Amazon.com, amazonprime, netflix, Streaming media.